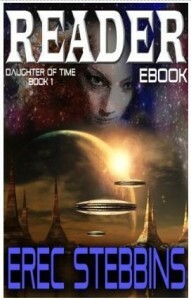 Today’s free eBook, Reader (Daughter of Time), is from writer and biomedical researcher Erec Stebbens. The novel is a complex science fiction drama that tells the story of a gifted, young Reader, Ambra Dawn, who is abducted by aliens for her ability to see visions of the past and future. Can 17-year-old Ambra Dawn save the Earth from a malevolent alien emperor in the late 21st century? Stebbins presents a dark vision of humanity in thrall to a merciless but technologically advanced alien race known as the Dram. Kidnapped by these evil aliens for her special gift (as a “reader” she has visions of the past and future), Ambra is subjected to torture that deprives her of her eyesight but expands her powers. She is later sold into slavery but freed by the Xix, a benevolent alien race. With her powers exceeding those of all previous readers, Ambra must travel through space and time to defeat the Dram and save the universe. Stebbins’s complex sci-fi novel is well plotted, and the world and alien races he creates are rich, clearly imagined, and full of detail. Readers of thoughtful science fiction that offers myriad allusions to everyday themes will welcome this springboard to a new and imaginative series. Reader (Daughter of Time) free through Amazon from Tuesday, February 24, 2014 through Friday, February 28, 2014. It currently has 4.5 out of 5 stars from 19 Amazon reviewers. For more free eBooks, check out our 10 Websites to Download Free eBooks list, as well as our Free eBook of the Day archive.